A vodka gimlet is commonly made with two ounces of vodka mixed with two ounces of lime juice and some ice, according to Food.com. But there are some variations on the mixture. Food.com lists nine different recipes for a vodka gimlet. If you make your vodka gimlet using the traditional recipe of equal parts vodka and lime juice over ice, CalorieKing reports that two ounces of vodka contains 145 calories and two ounces of Rose's lime juice has 13 calories, for a total of 158 calories. Using any other variation may cause the calorie value of the drink to change. Variations for the vodka gimlet include the Blue Ginger Gimlet that adds ginger syrup made with lots of sugar, fresh ginger and water, according to Food.com. Another variety substitutes strawberry juice for the lime juice in the drink. And a third variety, the Raspberry Gimlet, is made with Raspberry flavored vodka, lime juice and carbonated lemon-lime beverage. The calories in the drink could vary widely, depending on the ingredients you choose. Two ounces of vodka are virtually devoid of any nutritional value, according to the U.S. Department of Agriculture. But lime juice offers some nutritive benefits, including vitamins A, C, calcium, magnesium, phosphorus and potassium. 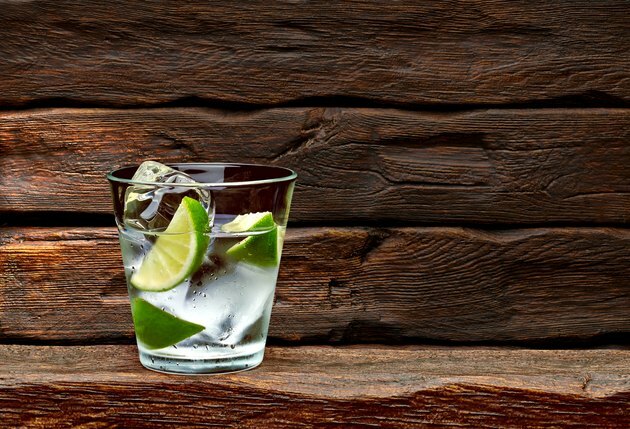 After drinking a traditional vodka gimlet, you may want to know how to exercise to burn off those calories. CalorieKing notes that to burn off the 158 calories in the drink you can walk for 44 minutes, jog for 19 minutes, swim for 13 minutes or cycle for 24 minutes.